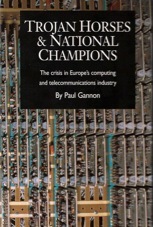 TROJAN HORSES & NATIONAL CHAMPIONS is the first major historical account of the European computing and telecommunications industry. It was selected as ‘Information Technology Book of the Year’ by the UK’s leading IT trade journal, Computing. It is essential reading for everyone who wants to understand Europe’s role in the IT industry. TROJAN HORSES & NATIONAL CHAMPIONS covers the growth of the European computer industry from 1945, through the ‘National Champion’ phase of the 1960s and 70s, and looks at attempts to foster co-operation between the big companies - ICL, Bull, Siemens, Olivetti and Philips in the 1980s and 90s. TROJAN HORSES & NATIONAL CHAMPIONS also provides a fascinating account of the development of the European telecommunications industry from it birth with ‘optical semaphore telegraphs’ through to today’s advanced fibre optics. The account of EU telecommunications deregulation is the best available. TROJAN HORSES & NATIONAL CHAMPIONS looks as well at the software industry and its development from the 1960s. Copyright control of software is identified as the key public policy issue in the software. TROJAN HORSES & NATIONAL CHAMPIONS is also a highly readable account of how the European Union has developed its industrial policy for this key high-tech industry. It makes vital reading for everyone interested in the information technology revolution and in European Union affairs.